Question of the Day: Do Some White People Oppose Pres. Obama Simply Because He's Black? I'm pretty sure for some this T-Shirt is going to make you angry, but for me it did just the opposite. 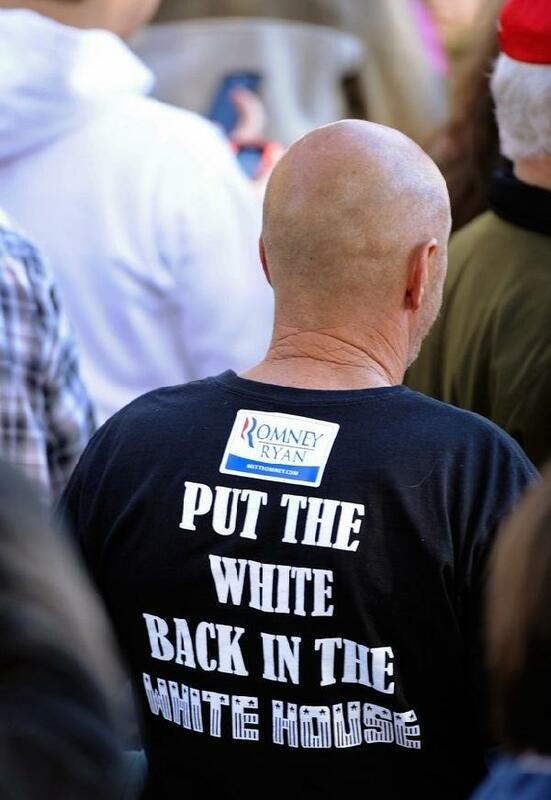 Shirts like this one that a supporter wore during a Romney campaign stop is not really all that shocking. The only thing shocking about it is the fact that someone decided to finally be honest. Instead of people asking this stupid question about whether or not Black People support President Obama because he's black; they should be asking whether or not some White People oppose him simply because he's black. Now, that's the question I would love to have an answer too even though I already know the answer. So here's the Question of the Day: Do some White People oppose Obama Simply Because He's Black? Of course ALOT of white people oppose President Obama only because he is Black! We as nation of Black people know this. We speak about it at work, with our families, around our friends. We have know this since he was elected! The level of disrescept that has been leveled at POTUS is disgusting! The question should be addressed to those elected officials that oppose him just to be spiteful. Sure regular voters may openly admit it, but elected leaders and those with the big money will not publicly admit to that. I see no reason to press for them to say the exact words because they won't. They have communicated exactly how they feel. We know the truth and we have to be satisfied with what we know to be true because it won't be spoken otherwise.